When we found out The Mountain had found love, we imagined this would be with a Brianne of Tarth style giantess. However, his new girlfriend, Kelsey Henson, is actually titchy-tiny. Kelsey is just 5’2″ compared with Hafþór Júlíus Björnsson’s 6’9″ stature. This naturally raises a lot of questions about their relationship. First of all, how does Kelsey reach up to kiss her gigantic bf? Luckily, Kelsey has satisfied our nosiness, explaining how the smooching situation works between herself and the professional strongman/Game of Thrones’ Mountain. How do you kiss? Do you jump in his arms every time and wrap your legs around his waist? Please post a picture of this impressive action. Makes a lot of sense. And I must say how super cute it is to see huge Hafþór acting like such an adorable big softy with his new miniature girlfriend. Despite their dramatic height difference, the couple seem genuinely delighted in each other’s company; posing for pics during their travels to Spain and Iceland where Hafþór is originally from. The couple have been dating since September after they met in Earls Kitchen + Bar in Alberta. Kelsey had been working as a waitress at the bar, and Hafþór happened to swing by while in town competing in a strongman competition. 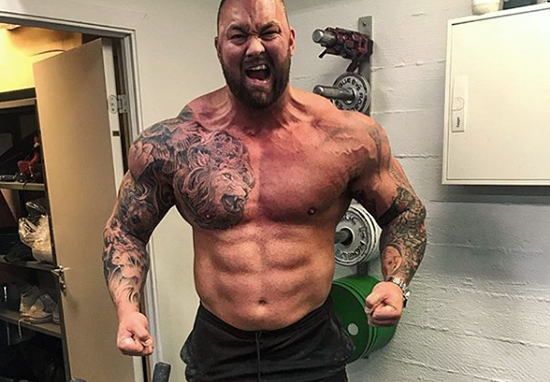 Of course, we all know Hafþór as the Mountain from Game of Thrones, but he is also mighty in his own right, having been Iceland’s Strongest Man seven times, and Europe’s Strongest Man three times. Kelsey decided to ask the giant for a cheeky picture, and the pair hit it off. Earlier this year, Hafþór showed true courage after revealing he was suffering from facial paralysis. They say opposites attract, and these guys are absolute proof.